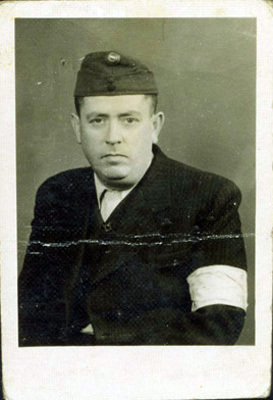 Katherine's stepfather, Armin Fingerhut, wearing a yellow armband. This photo was taken while he was in a labor camp near Budapest, Hungary in 1940. He was a sickly man, and they sent him home within two weeks. He died in 1944 in a hospital before the round-up at the age of 38.